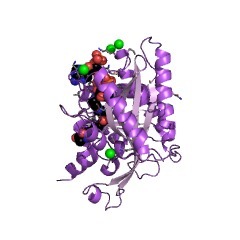 Histone acetylation is required in many cellular processes including transcription, DNA repair, and chromatin assembly. 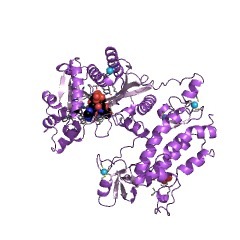 This family contains the fungal KAT11 protein (previously known as RTT109) which is required for H3K56 acetylation. Loss of KAT11 results in the loss of H3K56 acetylation, both on bulk histone and on chromatin (PMID:17046836). KAT11 and H3K56 acetylation appear to correlate with actively transcribed genes and associate with the elongating form of Pol II in yeast (PMID:17046836). 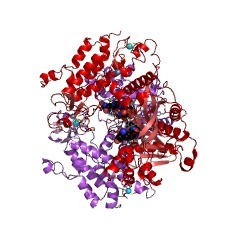 This family also incorporates the p300/CBP histone acetyltransferase domain which has different catalytic properties and cofactor regulation to KAT11 (PMID:18568037). 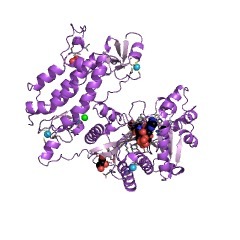 Histone acetylation is required in many cellular processes including transcription, DNA repair, and chromatin assembly. 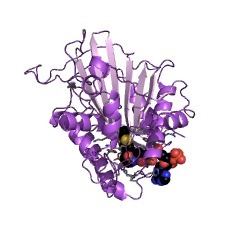 This family contains the fungal RTT109 protein, which is required for H3K56 acetylation [(PUBMED:17272723)]. In Schizosaccharomyces pombe (Fission yeast) loss of RTT109 results in the loss of H3K56 acetylation, both on bulk histone and on chromatin [(PUBMED:17046836)]. RTT109 and H3K56 acetylation appear to correlate with actively transcribed genes and associate with the elongating form of Pol II in yeast [(PUBMED:17046836)]. 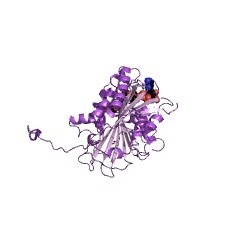 This family also includes p300/CBP acetyltransferase, which has different catalytic properties and cofactor regulation to RTT109 [(PUBMED:18568037)]. 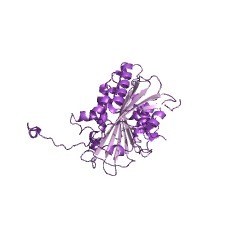 CREB-binding protein (CBP) is a transcriptional co-activator that acetylates both histones and non-histone proteins [(PUBMED:11359896), (PUBMED:15313412), (PUBMED:15313417)]. CBP binds specifically to phosphorylated CREB and enhances its transcriptional activity toward cAMP-responsive genes [(PUBMED:11701890), (PUBMED:16287980)]. There are 3024 KAT11 domains in 3017 proteins in SMART's nrdb database. Taxonomic distribution of proteins containing KAT11 domain. This tree includes only several representative species. The complete taxonomic breakdown of all proteins with KAT11 domain is also avaliable. Click on the protein counts, or double click on taxonomic names to display all proteins containing KAT11 domain in the selected taxonomic class. Fungal Rtt109 histone acetyltransferase is an unexpected structural homolog ofmetazoan p300/CBP. 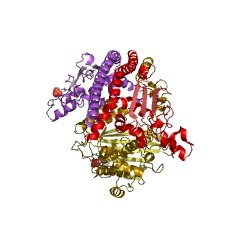 Rtt109, also known as KAT11, is a recently characterized fungal-specific histone acetyltransferase (HAT) that modifies histone H3 lysine 56 (H3K56) to promotegenome stability. Rtt109 does not show sequence conservation with other knownHATs and depends on association with either of two histone chaperones, Asf1 orVps75, for HAT activity. 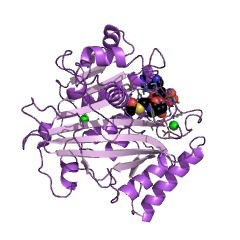 Here we report the X-ray crystal structure of anRtt109-acetyl coenzyme A complex and carry out structure-based mutagenesis,combined with in vitro biochemical studies of the Rtt109-Vps75 complex andstudies of Rtt109 function in vivo. 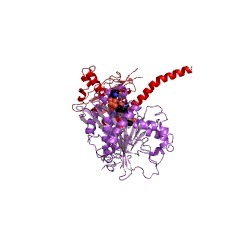 The Rtt109 structure reveals noteworthyhomology to the metazoan p300/CBP HAT domain but exhibits functional divergence, including atypical catalytic properties and mode of cofactor regulation. Thestructure reveals a buried autoacetylated lysine residue that we show is alsoacetylated in the Rtt109 protein purified from yeast cells. 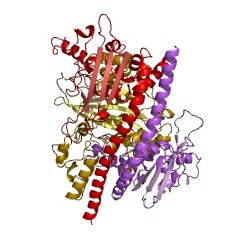 Implications forunderstanding histone substrate and chaperone binding by Rtt109 are discussed. Rtt109 acetylates histone H3 lysine 56 and functions in DNA replication. Acetylation of histone H3 lysine 56 (H3-K56) occurs in S phase, and cells lackingH3-K56 acetylation are sensitive to DNA-damaging agents. However, the histoneacetyltransferase (HAT) that catalyzes global H3-K56 acetylation has not beenfound. Here we show that regulation of Ty1 transposition gene product 109(Rtt109) is an H3-K56 HAT. Cells lacking Rtt109 or expressing rtt109 mutants withalterations at a conserved aspartate residue lose H3-K56 acetylation and exhibit increased sensitivity toward genotoxic agents, as well as elevated levels ofspontaneous chromosome breaks. 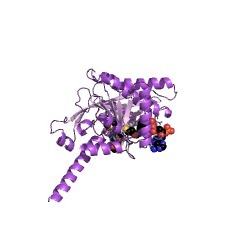 Thus, Rtt109, which shares no sequence homologywith any other known HATs, is a unique HAT that acetylates H3-K56. Rtt109 is required for proper H3K56 acetylation: a chromatin mark associated withthe elongating RNA polymerase II. 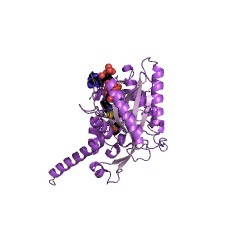 Histone acetylation has been shown to be required for the proper regulation ofmany cellular processes including transcription, DNA repair, and chromatinassembly. Acetylation of histone H3 on lysine 56 (H3K56) occurs both during thepremeiotic and mitotic S phase and persists throughout DNA damage repair. Tolearn more about the molecular mechanism of H3K56 acetylation and factorsrequired for this process, we surveyed the genome of the yeast Saccharomycescerevisiae to identify genes necessary for this process. A comparative globalproteomic screen identified several factors required for global H3K56acetylation, which included histone chaperone Asf1 and a protein of an unknownfunction Rtt109 but not Spt10. Our results indicate that the loss of Rtt109results in the loss of H3K56 acetylation, both on bulk histone and on chromatin, similar to that of asf1Delta or the K56Q mutation. RTT109 deletion exhibitssensitivity to DNA damaging agents similar to that of asf1Delta and H3K56Qmutants. Furthermore, Rtt109 and H3K56 acetylation appear to correlate withactively transcribed genes and associate with the elongating form of polymeraseII in yeast. This histone modification is also associated with some of thetranscriptionally active puff sites in Drosophila. Our results indicate a newrole for the Rtt109 protein in the proper regulation of H3K56 acetylation.